Continuing from the previous article where I talked about visiting Spiti valley in 7 days; in this article I will provide a few sample itineraries to cover Spiti valley in 8 days. I will suggest one itinerary covering the entire Spiti circuit; which will be applicable only in the months from June till September. Second itinerary will be from Shimla side only; meaning that you will reach Kaza from Shimla side and take the same road back for your return journey home. You can follow this itinerary irrespective of the month of your travel. However, for months from October till May, this is the only itinerary you will be able to follow with a few modifications of your own. Third and the last itinerary will cover only the Manali route and will leave out the road from Shimla side. You will reach Spiti valley from Manali and take the same road back. This itinerary too can be followed only in the months from June till September; and not in any other month. Are 8 days sufficient for a trip to Spiti Valley? Answer to this question actually is both a yes and a no. Yes in a way that you will be able to make a trip to Spiti valley in 8 days. If you were traveling in the months of summer then you can even complete the entire Spiti circuit. No in a way that you may still have to leave a few places out of your itinerary; and the journey may even feel a little rushed at a few places. So If possible I will still recommend that you add another couple of days and make it a trip for 9 to 10 days. Don’t get me wrong though. 8 days is still a sufficient enough time for Spiti valley. You can still have a fun trip and experience the magic that Spiti valley is. How you can do it is what I will cover in this article. Will Acute Mountain Sickness be a problem? It could be if you were traveling from Manali to Kaza. Slow gain in altitude and plenty of rest is the key to avoid altitude sickness; which doesn’t really happen if you went from Manali to Kaza. One day you are in plains, the next you are in Manali at 2000 meters; and then the next day you are in Spiti at 4000 meters. This gain in altitude is tremendous and doesn’t allow sufficient time to the body to adjust. The effects however mostly last just a day. Give yourself some rest after reaching Kaza, don’t stress out and you should be fine by next day, In case you are not then please seek medical help. For more information on what Acute Mountain Sickness is, what its symptoms are, how serious can it be and how you can avoid it; please read How to Handle Acute Mountain Sickness in Spiti Valley. Do you need any permits for Spiti Valley? Not if you are an Indian citizen. Indian nationals are free to travel from either Shimla or Manali side without needing to obtain any permits for Spiti. Please make sure though that you are carrying a government issued valid identity card; like Aadhar Car, Pan Card or you driving license; as you will need to register yourself at the check posts in between; and will be asked to produce an identity card. If you are a foreign national, then you will have to obtain an Inner Line Permit for Spiti valley from Shimla, Reckong Peo or Manali. For a detailed explanation of the procedure and related charges; please read How to Obtain Inner Line Permit for Spiti Valley. If you were however going from Manali to Kaza by private vehicle, rented bike or a private taxi, then you will have to obtain a permit to cross over Rohtang Pass. This permit can either be applied for online or obtained in person from DM office Manali. For more details, please read How to Obtain Permits for Rohtang Pass. I will begin by first suggesting an itinerary covering the entire Spiti Circuit. For the sake of this article, I will assume Delhi as starting point. If you were traveling from a place other than Delhi, then the journey for first and last day will be different, rest will remain the same. I will also assume that you are traveling by your own vehicle; either by a car or a motorcycle. Following this travel plan by public transport will be tough. For that, I will suggest a different travel plan towards the end of this article. Following this itinerary, you will reach Kaza from Delhi in the first 4 days. Then you will spend one day in Kaza relaxing and visiting the nearby places. The last 3 days of the trip will be spent for your return journey home; while visiting Chandratal on the way. Travel time on all these days will remain close to 7-8 hours a day (except for Manali to Delhi) depending upon your speed and breaks. But since we are short on time, there is really no way around this. Start early from Delhi on Day 1, possibly by 4-5 AM to avoid the morning Delhi traffic. Take NH1 then to travel all the way till Ambala. About 20 kilometers after Ambala and just before Chandigarh, turn right and take Himalayan Expressway to avoid Kalka and reach Shimla. After Shimla, continue another 60 odd kilometers to reach Narkanda and stay there for the night. I personally prefer staying at Narkanda because it is not crowded like Shimla and it also reduces your travel time on Day 2. If you made it to Narkanda before 4 PM, I will recommend that you continue traveling and halt for the night at Rampur, another 65 kilometers ahead. Road conditions for entire day will be a mix of good and average; total distance traveled will be around 400 kilometers till Narkanda. Also read: Top 10 Things NOT to do in Spiti Valley? Destination for today will be Chitkul which also if one of my favorite hill stations. Continue towards Rampur from Narkanda, cross the town of Jeori on the way; and then from Karchham, take the diversion towards Chitkul. Sangla is another major town that will come on the way to Chitkul. If you want to, you can also stay for the night at Sangla but I personally prefer Chitkul. Road conditions until Jeori will mostly be good but will get bad after that. From Karchham till Chitkul is mostly all badly broken dirt road. Travel time will easily be 8 hours so please ensure that you get an early start from Narkanda. The journey today will take you through some really bad roads. The entire section between Chitkul to Karchham and then until Pooh always remains in a bad condition. After Pooh however, the road will improve and will get excellent around Nako. Total duration of the journey will be again 7 to 8 hours so please start early. You will cross the town of Reckong Peo on the way and this is where most of the foreign nationals get the permits at. This is more of a relaxed day so you can even start a bit late in the day. Total journey will not be any more than 5-6 hours at most and the roads will be a mix of good and average. You will cross the towns of Tabo and Dhankar on the way and a visit to the monasteries here is highly recommended. For this day, you will stay in Kaza and make a day trip to the nearby villages of Spiti Valley. Do not check out of the hotel and leave all your luggage there as you will be returning back to Kaza by evening. Start early from Kaza so you can cover maximum places. If you covered all the 4 villages of Kibber, Komik, Langza and Hikkim, it will be around 100 odd kilometers in total. The entire journey however will be on dirt trails as there is no road up here. For completed details on how to visit these villages and a road map of the areas, see the two articles below please. From here on, you will start your return journey home while visiting Chandratal on the way. From Kaza, continue towards Losar and climb up Kunzum Pass. Once you reach the top of the pass, start descending down towards Batal and a couple of kilometers later, you will notice a board on your right pointing towards a narrow road that goes all the way to Chandratal. This is a narrow 14 kilometers road barely wide enough for one car so please be careful while driving on it. There are several camp sites at Chandratal that you can stay at of which, I will recommend Jamaica’s camps the best. For details on these camps and other tips on traveling to Chandratal, please see the article below. Distance traveled will be around 115 kilometers but will easily take you 6 hours at least. Today you will be traveling on one of the worst roads you ever encountered in your life; the notorious Batal Gramphoo stretch. Entire distance between Chandratal and Manali is just around 120 kilometers but it is bound to take you around 8 hours to complete it; that’s how slow you will go at several places. You will cross so many water streams that you will lose the count. Once you reach Gramphoo, climb up to the top of Rohtang Pass and then down to Manali. Nothing much to say about this day except for that this will be one long and monotonous journey. Distance traveled will be around 540 kilometers that can easily take 14-15 hours depending upon your speed and breaks so start early from Manali. The above itinerary however can only be followed between the months of June till September when Manali Kaza road is open. In all other months, you will not be able to complete the circuit and will have to take Shimla route for journey home as well. In that case, Itinerary followed can be as mentioned below. This of course is just a sample itinerary and the journey can be done in several other ways. How much distance you can cover in a day will also depend on whether you are on a bike or a car; how experienced at the wheel you are and how early you started but the itinerary above is ideal way to cover as many places as possible. Following the plan above, first 5 days of the journey will remain the same as I explained above. You will reach Kaza in first 4 days and then spend Day 5 in the town visiting the nearby villages. Change however is on Day 6, 7 and 8. Since the Manali Kaza route is closed, you cannot really exit that way from Spiti valley. This also means that Chandratal then will be off limits. On Day 6, you will reach Kalpa from Kaza which can be a really long journey so please start as early as possible; maybe by first light of the day. On Day 7, you will backtrack to Narkanda and then either stay here; or at Shimla; or maybe even proceed further to Chail. On Day 8, you will return to Delhi. A third version of the itinerary can be if you reached Kaza via Manali and return the same way. Traveling this way has its own set of advantages and disadvantages which I will discuss further in the article but let us first discuss the itinerary. 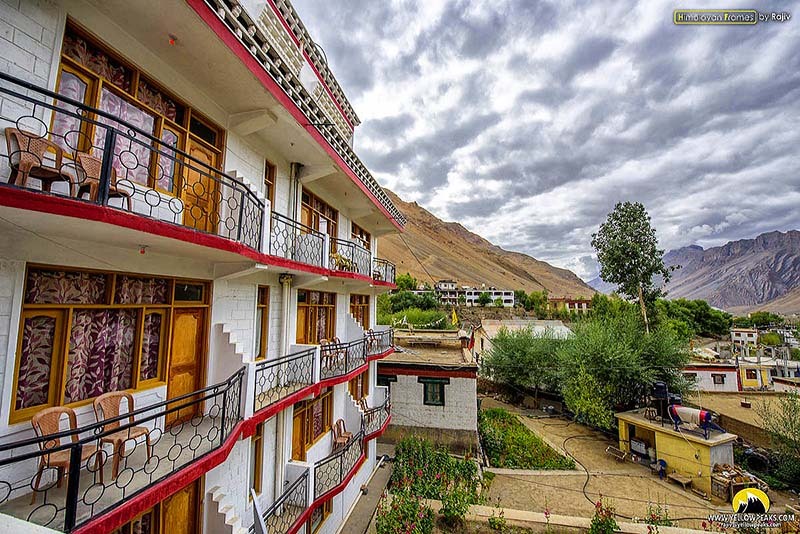 The biggest benefit this itinerary has is that it gives you ample of time to explore Spiti Valley only. You reach Manali from Delhi on Day 1 and then reach Spiti valley on Day 2 itself. On Day 3 you will travel to the nearby villages of Kibber and Komik. On Day 4 and 5 you will explore Pin Valley while staying for the night at Mud Village. For details on Pin Valley and a road map, please read How to Travel to Pin Valley from Kaza. You will then reach Chandratal from Kaza and take the same route back home via Manali. This all your time is spent in Spiti valley itself. Second benefit is that the long traveling hours are limited to Day 1 and 7 only. For rest of the days, you are traveling 6-7 hurts still but all this is actually spent in exploring the valley; not to get there. There are of course several challenges to this plan, some of which are as below. Acute Mountain Sickness will be another great challenge. The only chance of suffering from altitude sickness in Spiti is if you reached there via Manali. To know what AMS is, what its symptoms are and how you can avoid it; please read How to Handle Acute Mountain Sickness in Spiti Valley. This itinerary can only be followed between June and September when Manali Kaza route is open. Last but not the least, let me suggest an itinerary to travel to Spiti by Bus. There are several buses between Shimla and Delhi from ISBT and you will have no trouble finding one. From Shimla, there is a daily bus to Kaza with a night halt at Reckong Peo which you will board. You will reach Kaza on Day 3 by this bus. You will spend Day 4 & 5 in Kaza exploring Pin Valley and the nearby villages. For this purpose I will recommend that you rent a bike here for these 2 days. From Kaza, there is a daily morning bus to Manali which you will catch on Day 4. By this bus, you will reach Kunzum Pass top and deboard it near Chandratal diversion. From here, you will either walk 14 kilometers or hitchhike to Chandratal. On Day 5, you will again walk back to this point from Chandratal to catch the daily Kaza to Manali bus. Make sure you make a note of the time on Day 5 so you can get here in time on Day 6. On Day 7, you will board a bus from Manali to Delhi. In case you Manali to Kaza route was closed, then you will board the daily Kaza to Shimla bus on Day 6; and take the same route back to Delhi the way you reached Kaza. I hope the information above on how to visit Spiti Valley in 8 Days was of help. If you have any further questions, please feel free to ask in the comments section below and I will be glad to answer. You can also post a query at our Community Forum and I or any other member will post an answer and assist in any way that we can. Hi Wonderful information. travelling to spiti valley from 23rd of May 2019. shallbe crossing Kumzum pass on 1st of June. last year it opened around 20th May, but it might not be the case this year beacause of the heavy snow fall. if you can answar a few question would be great. 1. in any case if the route is not opened till 1st June, is it possible to get through with a 4 x 4? 2. perticularly from Chandra taal to Rohtang route, which vehicle you suggest forr the travel period 1st June Scorpio, Hexa, Creta or endeavour? 3. if scorpio, only question do they have improved brakes? or is the same as it was years back. I have gone through your posts regarding Spiti tour and are planning to visit Spiti from 10th August till 18th August. We are planning to reach Manali on 10th and start for Kaza on the same day. We wanted to return back to Manali on 17th August. Can you please advise the best itenery for Spiti in the said time. How are you traveling Govind? Thank you for such detailed information. I plan to take the Manali to Kaza bus on 13th October and get back to Delhi via Recong Peo. Will the roads be open from Manali or should I enter from Shimla? Also, how long does it take to reach Delhi from RP by bus? Depends on how the weather turns but the road should be open by 13th. Bus service howver will definitely not be open and you may have to look for a shared cab. RP to Delhi is about 18-20 hours easily. I’m going to Spiti (alone) in the last week of September-first week of October.Starting from Delhi on 29 Saturday noon and need to reach back on 7 Oct early morning (for the return flight). 1) Is there a chance that I might be able to do the whole circuit? 2) If there is, will it be real tight to cover all the places in the said days? 3) If not, can you short list two/three must visit places to have a relaxed vacation? 4) Can I visit chandratal even if the kaza-manali route is closed? 5) and finally, is there a way of knowing whether the Manali-Kaza route is open without actually having to travel to Manali then finding out? 2) No if you are traveling by your own vehicle. 5) It will be open until October 10th at least. Do I need to carry petrol cans/jerry cans for 8-9 days spiti valley tour or I will get petrol pumps in this circuit. You will find petrol pumps on the route, no need to carry spare fuel. Hi bro can u suggest me best bike rental agency….In shimla .For shimla to manali South circuit ? Hi Sheba – Both ways is fine. Staying at Kaza just makes things a bit easier. You can leave your luggage at the hotel in Kaza and travel freely, knowing that you will return by evening. If you wish to however then yes, you can stay at other places as well. For example, go to Pin Valley and stay there for the night. Next day, return to Kaza while covering Dhankar Tabo etc. Thanks for all the details. I am planning a solo trip as per below iternary. Let me know If I can follow the iternary in your post in these days. Also can you let me know which places will be good to stay in Spiti Valley. Hi Nikhil, You can travel like this. Thank you for your detailed itinerary for Spiti. I am planning to cover this circuit in May 2019. Me and my wife will be travelling. We will be reaching Delhi on 11th May and catch a bus to Shimla in the night, so that we will reach Shimla the next morning, and will stop at Narkanda for our night stay. Q1) Is this itinerary feasible? Would you suggest otherwise? Q2) We were planning for hiring a car From Shimla To Shimla. How much will be the cost? Q3) Can you please suggest an approximate budget for each person to cover this whole plan? Can I travel back from Kaza to Shimla in 2 days ? Is there any bus available where we can spend night in Chitkul and continue the next day? Yes you can travel from Kaza to Shimla in 2 days but cannot add Chitkul in between. For Chitkul, you will have to make it a 3 days journey. Thank you for your detailed itinerary for Spiti. I am planning to cover this circuit from June 10 to June 18 via Manali So your post is insanelyinsanely helpful. 1) So I have a friend who recently learned how to ride a bike and he is also joining me on this trip. Question is is it safe have him ride on his own considering that he is pretty much new to using bikes? Also he doesn’t have a license (though he has a learners license) Are there going to be checkpoints I am really hesitant to have him do this just want to check with you about that. Secondly what are the ideal night stay options available on budget for backpackers? I have heard you can stay in the monasteries and cut down on accommodation costs. Is it possible? 1. Take him as a pillion. Don’t take the risk. There are check posts in between where you may be asked to produce your DL while registering. 2. Almost at all the places on the circuit, you will easily be able to find a place to stay for Rs. 600 to Rs. 700 for the night.